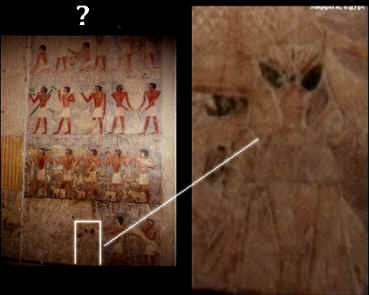 On a wall painting in Egyptian burial-vault Ptahhotpe in Mastabas, in North Saggara, there is the essence similar to those known today as "aliens". 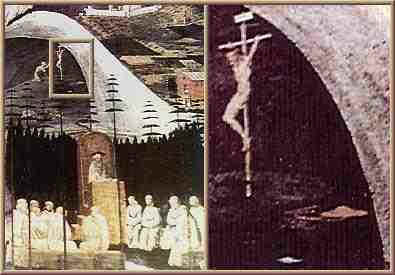 Their occurrence to the man is fixed not only in historical monuments B.C., but through all the history up to now. 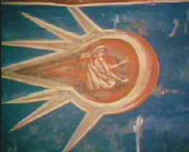 In the picture by Paolo Uccello “La Tebaide” (is written from 1460 to 1465) an object in the form of a UFO is represented near Jesus. 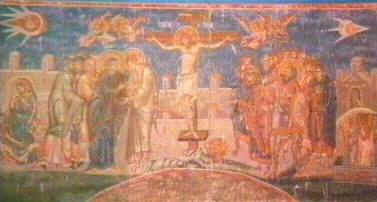 The fresco (photo below) on the walls of Visoki Decani Monastery in Kosovo, Yugoslavia was created in 1350AD. On both the sides from Jesus there are humanoids in strange kind of flying machines .